arrives in Duluth for the weekend. See photos and a video in the article below. The last time we saw the amazing 261 Steam Locomotive in action was in the fall of 2007 when it ran a fall color rail excursion along the Mississippi River. We didn't get tot ride the train on that occasion but followed it from Winona, Minnesota to LaCrosse, Wisconsin getting several photos of the train and its classic railroading cars. A year after that trip the 261 took a "leave of absence" from rail trips to undergo some major maintenance to its boiler and running gear. During this interim til the 261 returned to service, we did get to ride on the same vintage rail train on a fall excursion to Superior, Wisconsin . . . except the train was pulled by a pair of Amtrak diesel locomotives. It was truly a blast from the past riding the train and being waited on and entertained by a staff of railroading afficinados playing the roles of 1950s era conductors, porters, etc. The 261 returned to service in 2013 but other travel plans prevented us from riding or seeing her back in action. 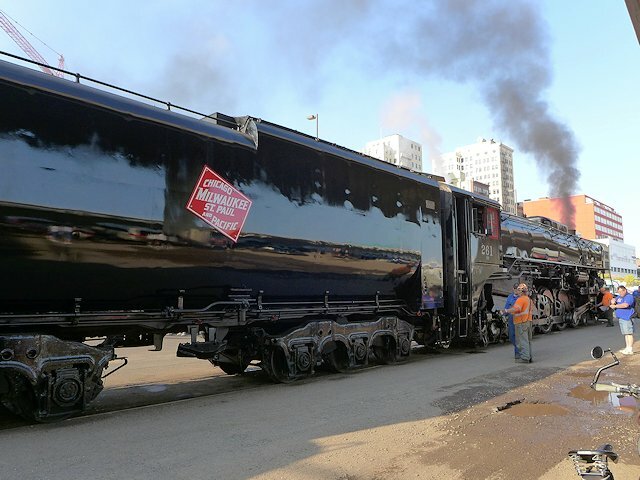 When we heard she was coming into Duluth in June of 2016, we drove to Duluth to see it coming into town at the Depot of the Duluth Lake Superior Railroad Museum. 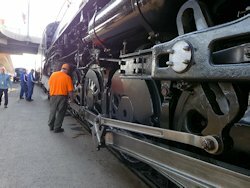 Below are some pictures of the locomotive with descriptions and a video I made of the train as it came into town. 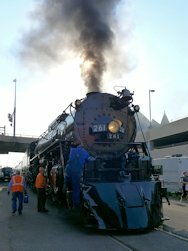 In 2018, the Milwaukee Road 261 Steam Train excursion (from Minneapolis) returns to Duluth on June 9 and 10th. 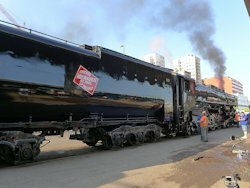 It will arrive at the Lake Superior Railroad Museum on Saturday afternoon and overnight there until departing on Sunday for the return trip. You can see the train at the station Saturday afternoon or Sunday morning. These two photos give you an idea of the size of this beauty. Standing 15 feet 6 inches high and weighing in at 460,000 pounds; a ultra heavy weight fighter indeed. In the one photo you can see the fire burning in the boiler through the headlight. The 261 Engine and Tender is 109 feet 7 inches long and can carry up to 25 tons of coal. It's water capacity is 20,000 gallons. She is an S3 style locomotive with a 4-8-4 wheel arrangement. The S3 was the zenith in steam engine technology. 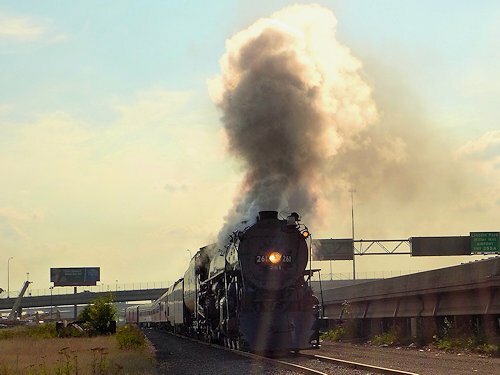 The 261 was built by the American Locomotive Company, Schenectady Works for the Chicago, Milwaukee, St. Paul, and Pacific Railroad Trust , and was completed in July of 1944 (serial # 71974). In its excursion to Duluth and back the 261 carried a roster of impressive, restored classic railroad passenger and baggage cars including the 1914 Pullman Lamberts Point Sleeper & Lounge Car and the 1948 Cedar Rapids Sky Top Lounge Car designed by famed industrial designer Brooks Stevens. These and other classic heritage railroading cars are shown in the following video. < < < Interior of the St. Croix Valley 1st Class Passenger Coach. 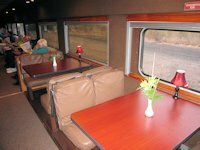 On our ScenicPathways website you can see some pictures of the interior of some of the vintage rail cars and our article on our 2012 Milwaukee Road rail trip. 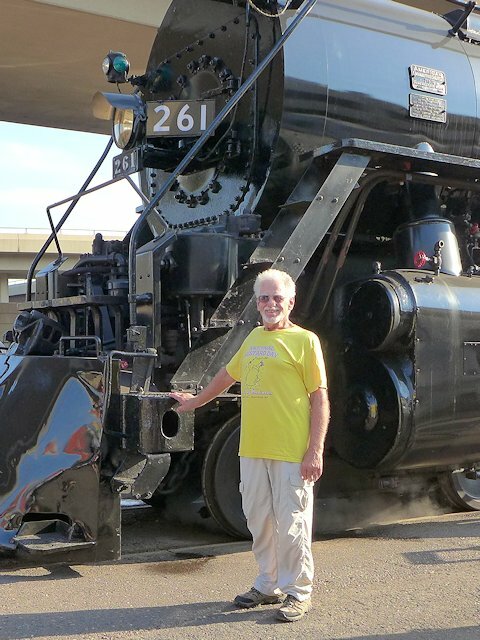 This trip had essentially the same set of classic cars as the one shown above - with the exception of being pulled by an Amtrak Diesel instead of the 261 Steam Locomotive. Rail Fans who'd like details on this Steam Excursion will enjoy Robert Taburn's 261 Duluth Steam Trip Route Guide. The Lake Superior Railroad Museum & the North Shore Scenic Railway also operate Steam Powered Fall excursion trains but presently, like what was needed on the 261, Steam Engine #2719 is on layoff for needed repairs and required maintenance. But I've been told by a North Shore volunteer train fireman that by the spring of 2017 another steam locomotive will be ready for service: the Duluth and Northeastern Locomotive #28. Lake Superior Circle Tour Route. Enjoying lake breezes and views at the Canal Park Brewery Beer Garden - Canal Park. Camping along the Lake Superior Circle Drive. Reviews & Ratings of Minnesota North Shore golf courses. 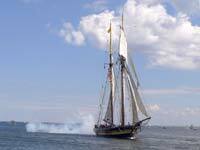 Lake Superior Circle Tour Road Map & Guide to Travel Attractions around Lake Superior. Identifying Lake Superior Agates and Beach Rocks. Superior Trails Guide to MN North Shore State Park Camping and Campgrounds. Duluth's Enger Park and Enger Park Tower. Grand Marais Minnesota and its beautiful harbor voted as the favorite village around Lake Superior by circle tour travelers. Our Reviews of the best guides to Lake Superior Agates and Beach Rocks.